Is that fresh blossoms I smell? Birds chirping? Hints of ghostly white winter skin visible on arms and legs everywhere. Ladies and gentlemen, spring has arrived! Oh, my beloved Spring, how I’ve missed you. It was a long, cold and rainy winter here in Taiwan. I was waiting, not-so-patiently, for your arrival. I thought about you constantly, especially when having to put on five layers of heavy clothes to stay warm, and when I had to go outside and face the elements. I longed for you as I stood freezing at the bus stop. I yearned for you when I got out of a hot shower and into the cold air in my house. But you came back, just like you always have. If it’s possible, I’m even more thrilled at the arrival of spring this year. I love the fashion trends for this season and can’t wait to wear my pastels and lace. It really did feel like the winter was extra long this year. Not only is the weather getting nicer, people in general are nicer, too. 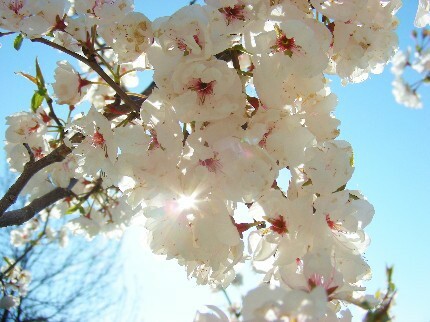 With spring comes the sun, and the presence of the sun brings out cheerfulness and optimism in the masses. Spring brings a new beginning. We can spring clean our homes, our lives, our thoughts and ourselves. So, here’s to the arrival of the sunny season and a fresh start! (*raises invisible glass awkwardly…) May you have a lovely and happy spring! I love when flowers start blooming and the leaves begin growing back...the heat can be intense here but I try to appreciate the positive aspects of all seasons. I love Spring, I just wish it would go back to the not too hot/not too cold weather we had a few weeks ago, it is now back to being uber cold. Here in Taipei it's still cool in the mornings and sometimes it still gets cold at night. But during the day it's just perfect! Being from South Africa originally, I'm also used to having spring in September. Good luck with the cold months ahead! Yes, Spring is all of those things. But it also means free water ice at Rita's. Do you have them there? Cherry blossoms! My fave thing about spring!